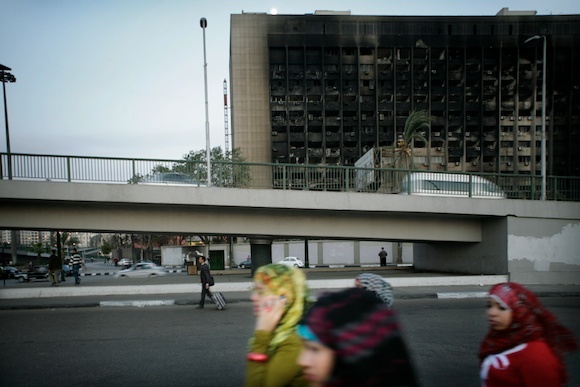 Egyptian girls walk in front of the burt out former headquarters of Mubarak’s NDP Party in Central Cairo. In front of the building: tanks, soldiers with automatic weapons, barbed wire and an incredible traffic jam. Once we have managed to take the unavoidable hurdle of the inevitable collection of security men who busy themselves with smoking cigarettes, shouting in telephones and trying to look important, we walk up the stairs of the run-down media station/Ministry.